Applying a gentle vacuum pressure to the tap increases the amount of sap collected. This pressure is like that of sucking on a straw. 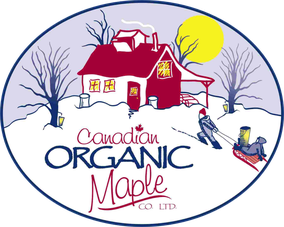 The Canadian Organic Maple sugarbush involves 750 hectares (1850 acres) of New Brunswick forest. This is the same size as 1,400 NFL football fields. It takes 40L of sap to make 1L of Maple syrup. That's a lot of sap to make one bottle of syrup! Another way to think of this is: if you boiled down 1L of sap, it would make 1 teaspoon of syrup! 1 cup of Maple syrup contains more calcium than 1 cup of milk. Sap is held in the tree’s wood just under the bark. That part of the tree is called the sapwood.